Let’s talk the Joker and get into a Joker character analysis. Arguably the most well known Batman villain, with the recent casting of Jared Leto as the Joker in the upcoming Suicide Squad film, I thought it was a great time to get into the mind of the Joker, and why his character is the way it is. 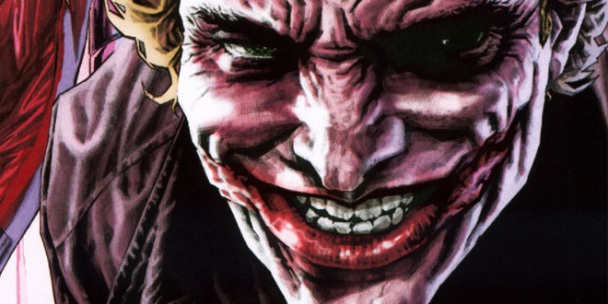 There’s been many iterations of the Joker in the past, so the main basis of this Joker character analysis will be off Batman: The Killing Joke. So let’s get into the weird mind of the Joker! The Joker is a disgusting character. The stuff he does to other people is the lowest of the lows. But he is also a fascinating character, with an interesting worldview, which is why I love him so much. Many people aren’t fans of the Joker because he has no real back story. With other villains you know why they become the way they are and it gives us a really interesting, complex character, that you can sympathise with. The Joker is interesting because you don’t know how he became to be the Joker, but you do get to understand the way he thinks, and it’s actually very interesting. In philosophical terms, the Joker is an absurdist. So first lets breakdown what an absurdist is. Basically an absurdist has their own realisation that the absurdity (the meaninglessness) of life is unavoidable and that fleeing from the absurdity of reality into illusions or religion or death isn’t going to get you very far. Instead an absurdist embraces the meaninglessness of life, and rebels against it. The two basic fundamental ‘facts’ an absurdist believes is that a) Our lives are built on the hope of tomorrow, yet every day brings us closer to death and b) True knowledge of the world is impossible. An absurdist has come to acceptance that you never really get what you desire in life, and so they learn to love the ‘unanswerable strangeness’ of life. An absurdist believes that searching for order in such a meaningless and chaotic world only brings you into conflict with the universe. Soooo you know who hates order and loves chaos? Yep, the Joker. 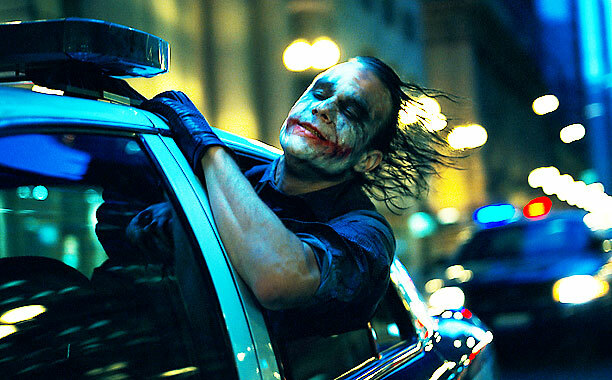 The Dark Knight movie explored how Batman was the personification of order and the Joker was the personification of chaos. 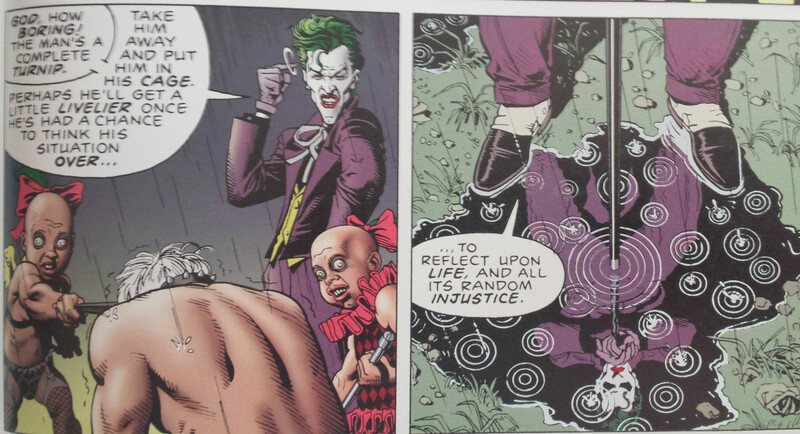 Because for the Joker, there is absolutely no purpose in trying to create order and reason in such an absurd world. OnBeing says that for an absurdist “ignoring the Absurd or refusing to realize it removes from the mind an essential knowledge—an essential knowledge that allows for the richest and most fulfilling life experience”. This quote reminds me of that scene in The Dark Knight where the Joker is playfully sticking his head out of the cop car’s window like a dog. He looks like he is truly enjoying life, and embracing the absurd (whilst looking super absurd). 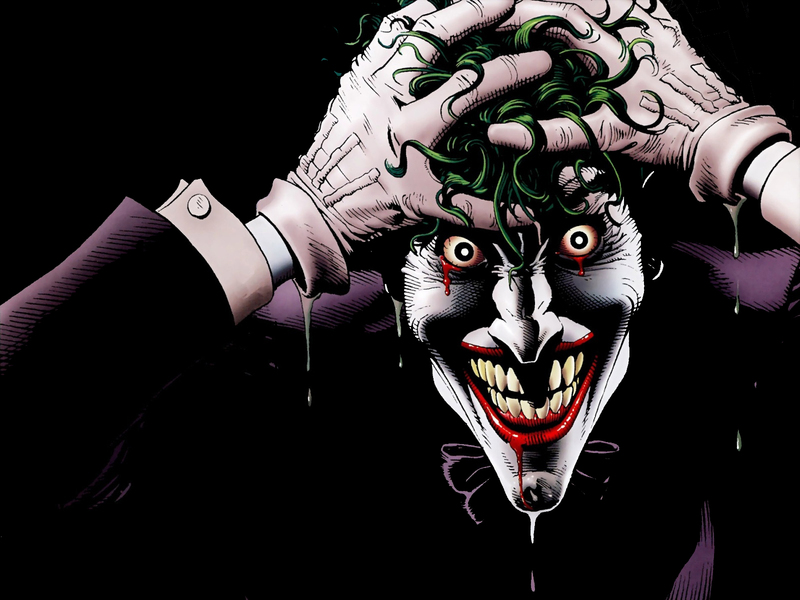 Let’s now take this Joker character analysis discussion to the graphic novel Batman: The Killing Joke. 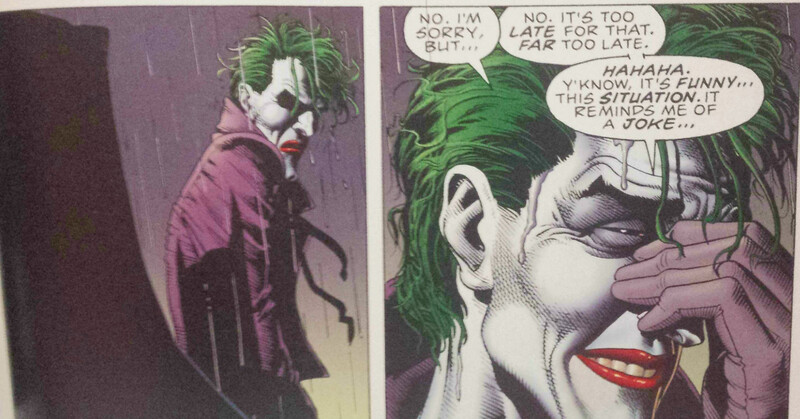 In my opinion, it’s probably one of the best Joker stories ever written. Written by Alan Moore (Watchmen, V for Vendetta), it definitely explores the Joker’s absurdist worldview. So in Batman: The Killing Joke, the Joker wants to prove that like himself, all it takes is one bad day to break a man. Now before I get into the analysis of The Killing Joke, I just want to discuss the Joker’s origin in the novel. 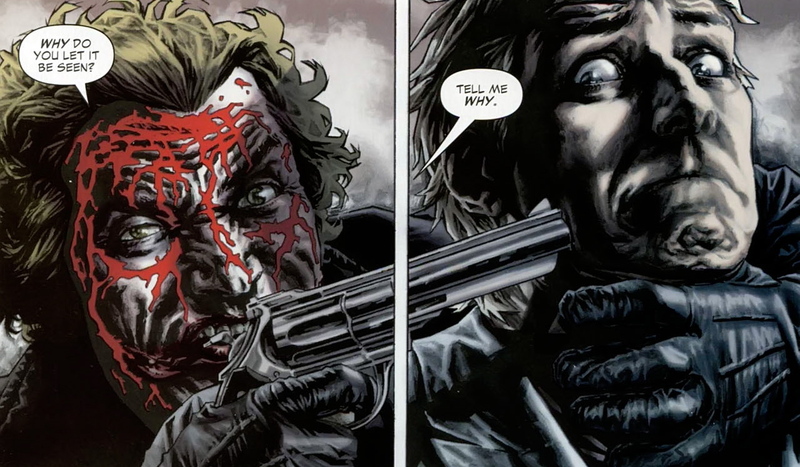 In the Killing Joke it outlines an origin story for the Joker, in which in an effort to support his pregnant wife he joins a gang to earn some cash. However his wife accidentally dies and he ends up being washed in chemicals, everything went wrong. Personally I don’t think any of that ever happened (other than the whole ending up in chemicals thing that is). In the Killing Joke he discusses how he doesn’t like memories, and that he always mixes up his memories anyways (as he says he prefers memories to be multiple choice). To me this origin story just sounds like another story the Joker has made up. Like in The Dark Knight where he gives people different stories about his scars, I believe this was just another story about his origin. Instead of rejecting his circumstances, and instead of rejecting what life throws at him, the Joker instead chooses to embrace it all. He has given up trying to rationalise the world and what happens to him, so for him, freedom is not contemplating the why’s of what has happened to you, freedom is about embracing everything (the good and the bad) and not letting it bring you down essentially. Here the Joker is reflecting on his current self. After being broken down by what ever his one bad day was, his notions of order and sanity were thrown out the window. He then saw the world as random and pointless after the random and pointless horrific act that occurred to him. And of course that made him the way he is today, because well, any other response would be crazy! Now we reach the part of the story where Batman comes to defeat the Joker once and for all. The last few pages shows us what the Joker thinks of Batman. He sees Batman as someone like him. Someone who has also been through tragedy, and has had to deal with the random injustice of the world. Except he wants Batman to finally see things his way. That there is no point in trying to make sense of life and that’s there’s no point in struggling anymore. But the joke is on the Joker. Because his elaborate plan of proving his point failed. It didn’t take one bad day for Gordon to completely crack and go insane. Even after the torture he still believed in order and justice, and wanted to bring in the Joker by the book. That didn’t sit well with the Joker at all. Because even though he pretends he doesn’t care about making sense of the world, every single thing he tries to do is almost an attempt at making sense of the world. He latches on to Batman to help create his sense of the world. He wants Batman to finally understand him, so that he can understand himself and the world. But through all of his actions, the Joker is just too far gone to ever become rational again. Batman even tries pleading with him, tries to talk to him, tells the Joker he wants to help rehabilitate him. And in a single panel you can see the Joker contemplating the offer, contemplating finding a sense of rationality and meaning in the world again. But he instead chooses to reject Batman’s offer. The Joker doesn’t trust the world anymore, and definitely doesn’t trust Batman anymore. The joke he tells at the end of the Killing Joke to Batman emphasises that lack of trust. “You wear your shame like a badge, because you don’t have the balls to actually pin it on. Desperate to be feared, you want to be perceived as a monster, draped in black, and yet, you leave that little window. A glimpse at the perfection underneath. Obvious-the chiseled good looks-not the jaw, the mouth of a monster. Why do you let it be seen? Tell me why”. To which Batman replies, “To mock you” (gotta love them sassy one liners Batman likes to throw around). The Joker likes to pretend that the world is obvious, obviously senseless that is. And he likes to pretend he doesn’t care, but he does! Here the Joker is trying to make sense of Batman. Why does Batman leave a glimpse of humanity when he’s trying to be a monster? What’s the point in doing that? Joker wants to know what the point is. And as he pretends not to care about anything, his jealously comes out. Here Batman hasn’t let his tragedy and the random, pointless things that have happened to him overcome him, he has used it to become a better person. The Joker has let his tragedy and the random, pointless things that have happened to him overcome him. But he views it as embracing it, but it’s not embracing it, it’s letting it overcome you until it drives you into insanity. He knows Batman is a better person than him, and he wants to make sense of Batman (maybe learn something from him), because deep deep down he doesn’t like being insane. So the comments he says reflects that want to be like Batman, to be sane and rational, as he sees that Batman is better than him. He talks about Batman’s mouth, his chisled jaw. Compare that beauty to the imagery of Joker’s scarred and bloody mouth. 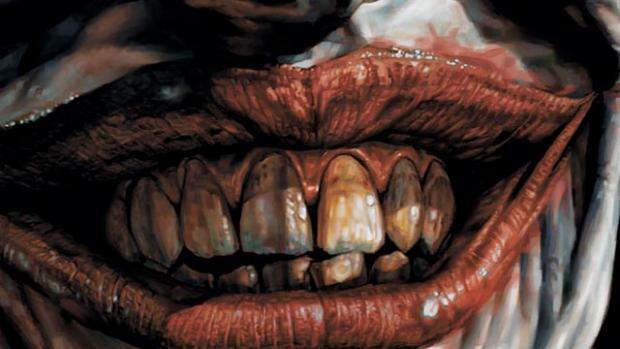 That imagery of Batman’s err well beautiful mouth compared to the Joker’s not so beautiful mouth, is used to emphasise the difference in the type of people they are. Overall the Joker will continue to embrace the random and pointless world, whilst he occasionally tries to hunt for some rationality and sense through Batman. And it’s because of that very subtle inner conflict (well at least a lot more subtle than Two-Face) and interesting worldview that the Joker is truly a fascinating character with a lot of great stories to tell. So here’s hoping Jared Leto is able to do this character justice (which I think he will). 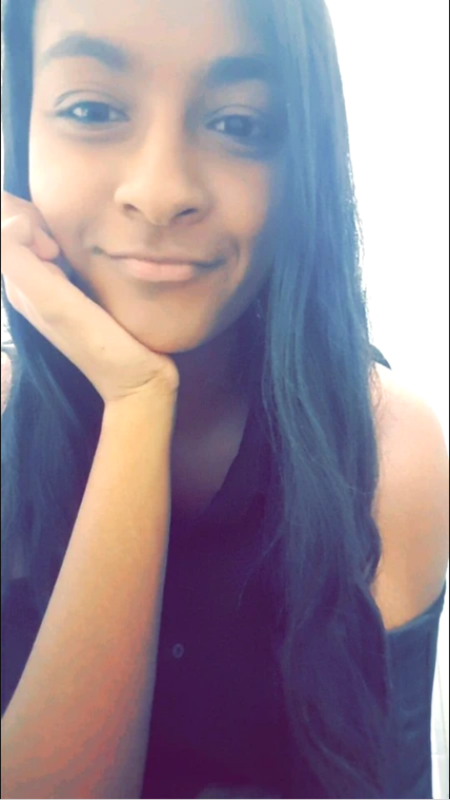 Anyways what do you think? Do you agree with my Joker character analysis? Or do you view the Joker differently? Let me know! Seems like you pretty much got it. Hatred the climax of the Dark Knight. Batman didn’t stop Joker’s bombs he kind of just lucked out. Totally not Batman’s style. Batman lines are pretty cheesy in that movie too, wish they would have given Bale some Moore dialogue to say. The worst was Joker laughing in Batman’s face in their very last scene together. I wanted to see Batman shut that clown up by the end of the movie. Even Alan Moore didn’t end Killing Joke on that panel of B-man and Joker laughing together. Joker didn’t get the last laugh in Azzarello’s book neither if I’m remembering correctly. But at the same time that whole bomb thing worked in the Dark Knight because it proved the Joker’s ideals about humanity were wrong and that they were inherently good. Your right. i just kind of want B-man to be %100 awesome and do everthing right all the time. Cooler for me if he stops the Joker’s plan himself or has Gordon do. Just so its not all up to chance. Joker is the chance guy, B-man always has a plan. have a look upon my analysis i love your analysis. actually more deeper into comic character he evolved with time. Thanks, I’ll make sure to check out your post! I know a person just like the joker. Holy balls!